Many people go through physical therapy after an injury to regain their ability to walk. A walker is an essential tool for physical therapists who are helping patients recover from leg or back injuries, regain their sense of balance, or need to build strength in order to walk unassisted. Walkers allow them to build strength while maintaining mobility. A disadvantage to using walkers therapeutically is that they don't provide feedback to patients or their therapists about how much patients are depending on the walker throughout the course of rehabilitation. 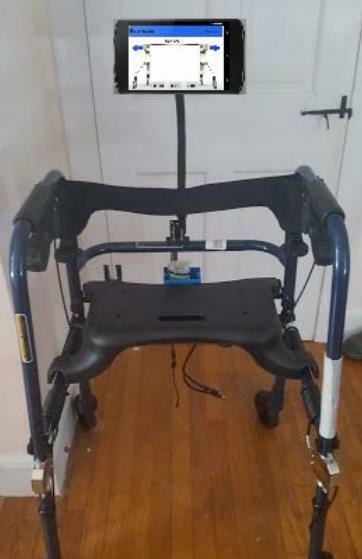 The Smart Walker is a standard walker that has been adapted with pressure sensors that indicate the extent to which a user is leaning on each side. There is a bar mount that holds a tablet, which has an app installed that was developed by the team. It provides user-friendly infographics to display the patterns of an individual's walker dependence. When Wi-Fi is available, the data is also stored in an SQL database that a therapist can access for further analysis. In addition to displaying historical use data, the Smart Walker provides real-time feedback to help patients correct their alignment, graphs that show the cumulative time spent leaning in each direction, and the ability to post comments to enable clinician-patient communication between in-person sessions. The current prototype is complete. Over 380 million people in the world suffer from Diabetes Mellitus, and its prevalence is expected to double in the next decade. The most common method of self monitoring requires invasive finger pricking, which can be painful and lead to bruising, loss of sensitivity in the affected nerves, and blood-borne infections. Alternative solutions based on optical technologies are expensive. There is demand for a glucosemonitoring method that is more comfortable for patients. 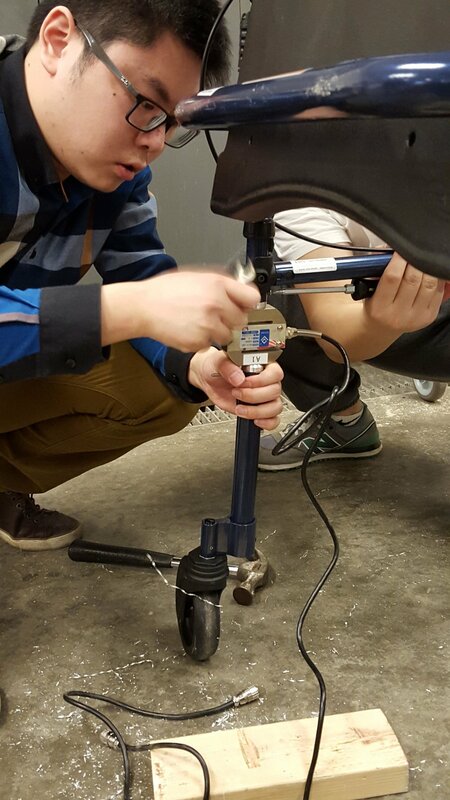 This project measures glucose concentration from a saliva sample detected by a biosensor developed by Prof. Wang. The design uses a potentiostat circuit that interfaces with the sensor and performs an amperometric measurement by applying a constant bias potential between the working and reference electrodes via a digital-to-analog converter. The sensor signal is conditioned through a three-stage amplifier and a filtering circuit that helps achieve high resolution. The signal is sampled and integrated in firmware to acquire a current density that is linearly proportional to the concentration of glucose present in the saliva sample applied. The correlated salivary glucose concentration is then displayed on the LCD. An iOS app was developed that takes in a user’s correlated blood glucose level and interfaces with Apple’s HealthKit to provide secure data storage and features such as temporal plots and sharing of glucose readings with family members and health professionals. The project is complete and the project won a prize at the 2016 ECE Design Competition. Hemispatial neglect is a common impairment that patients face after having a stroke in the right cerebral hemisphere. The condition is characterized by an inability to process and perceive the left visual field, even though both eyes continue to function normally. It is often possible to recover from hemispatial neglect— physical therapy treatments include promoting visual scanning strategies and sustaining visual attention in the affected portion of the visual field. Unfortunately, therapy sessions are short, the exercises involved begin to feel arbitrary and tedious quickly, and patients commonly don’t adhere to the at-home therapy schedule prescribed to them. 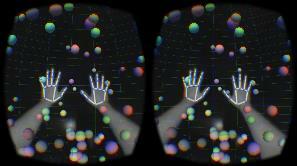 Following a needs assessment with therapists and researchers, the team developed a prototype for two VR games, which patients can play using an Oculus Rift VR headset. A Leap Motion camera is mounted on top to track hand and arm movements. The games encourage the same visual exercises achieved by conventional therapy, but the novelty of the immersive games makes the exercises significantly more engaging. The digital nature of the games also allowed the team to develop performance metrics, which give therapists a window into their patients’ progress at home. By gamifying the physical therapy regime for spatial neglect, the team has demonstrated the potential of applying VR technology to physical therapy.